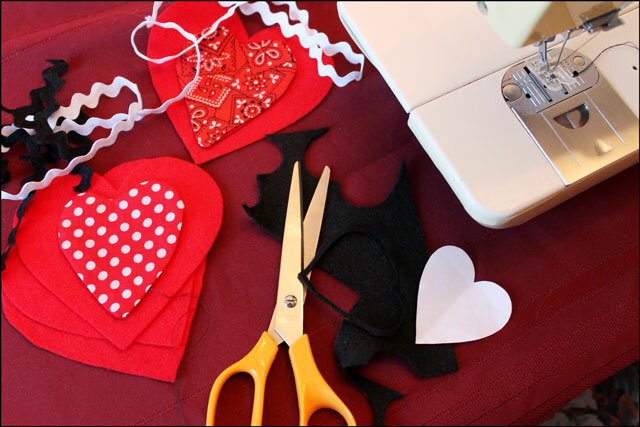 I have a love of hearts, so last week I took a walk along Queen Street West and visited the sewing shops there to find supplies with which to make some heart-shaped decoration. 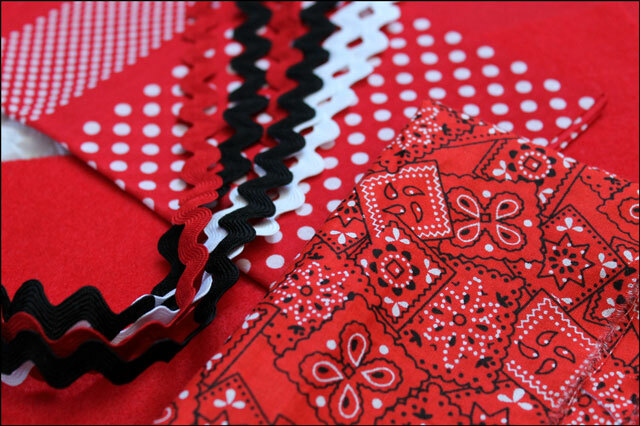 I came home with a variety of printed cottons, pieces of felt and ricrac, in a red, white and black colour scheme. This area of the city is changing now but these shops, which have been located there for a very long time, are filled from top to bottom with the most amazing supplies for making things. They are dusty and a bit haphazard but I love going into them and just letting ideas come, based on what I see. I've been poking around the same stores since I was a teen and I'm sure there is still some fabric there that I actually touched back then. 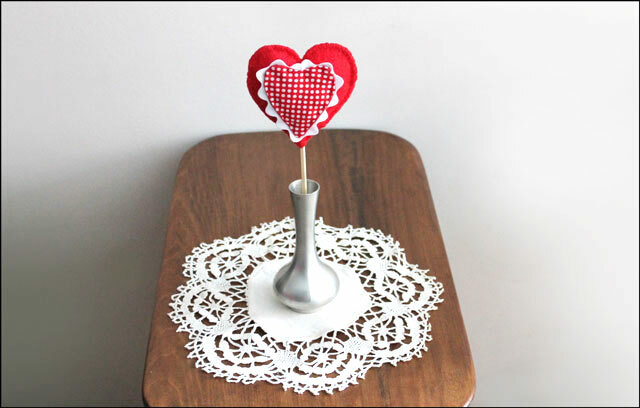 To make some heart decorations for yourself begin by cutting a heart shaped pattern from paper. 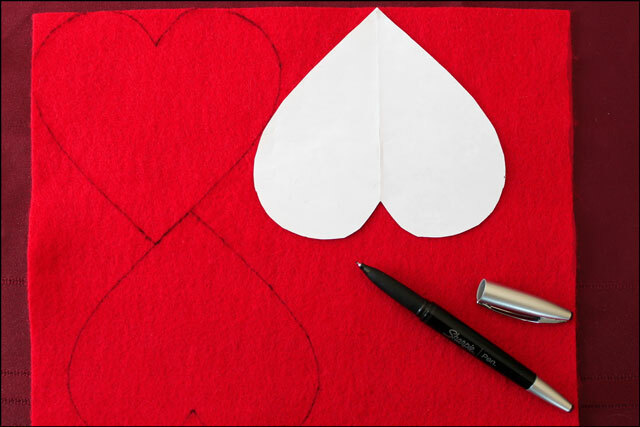 Do this by folding the paper in half and drawing half a heart, with the fold running vertically down the middle. That will ensure that both sides of the heart are the same, because when you cut it and then unfold, one half will be the mirror-image of the other. Make the largest one first and then make a second one (and a third one, depending on how many sizes you want). Use the copy to make the smaller size by trimming it, an equal distance all around. This will give you heart shapes that match when layered one upon the other. 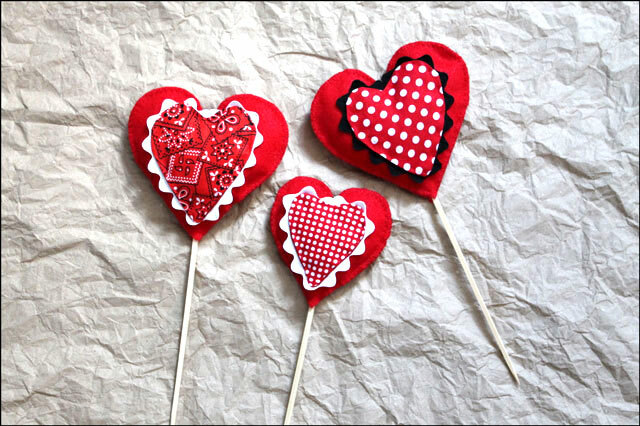 To make the cotton hearts (which are the printed fabrics), cut two of each and then. Then, with the wrong sides together, sew around the edge with a sewing machine, leaving a 1 inch gap so you can turn the piece right side out. Once turned, iron your heart and hand-stitch the gap closed. This gives you a nice clean heart-shape, with no raw edges. Everything else can be stitched by hand. 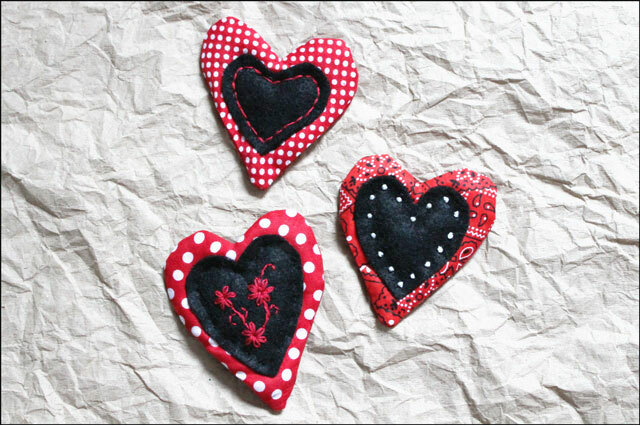 First attach the cotton hearts and the ricrac to the felt ones, and add any embroidery you want. 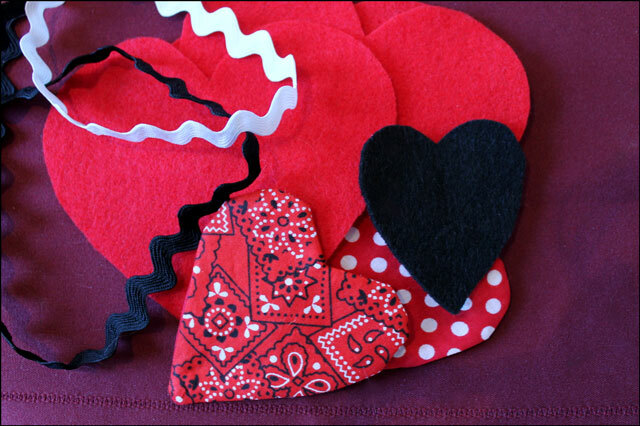 Then stitch the felt hearts together, using a blanket stitch around the edge. Add a bit of stuffing to make them puffy, before stitching them closed. 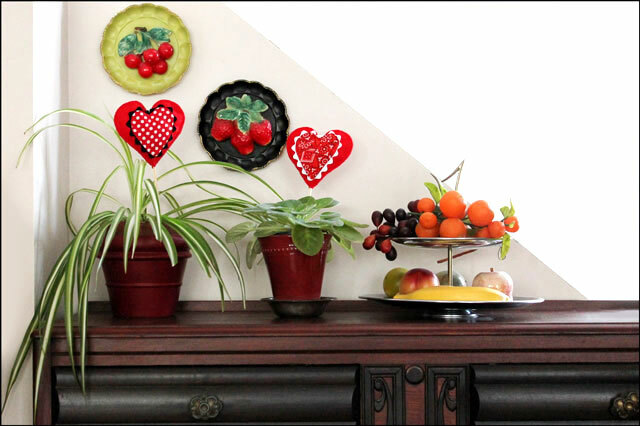 I included a wooden skewer into some of them so I could decorate some plants. 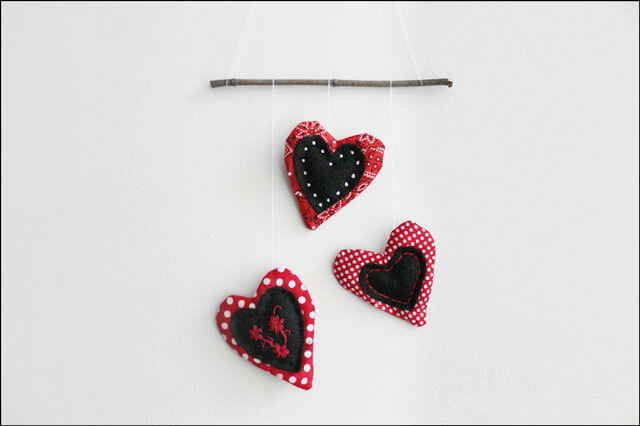 And I hung the smaller embroidered hearts with thread and a branch to make a wall hanging. About the chair in these pictures .... When I met Nick he had just made major changes to his life, getting rid of most of his belongings, selling his home and moving into a room in a rented apartment with some other people located right downtown. Basically he was leaving his past behind and setting out on a new adventure. 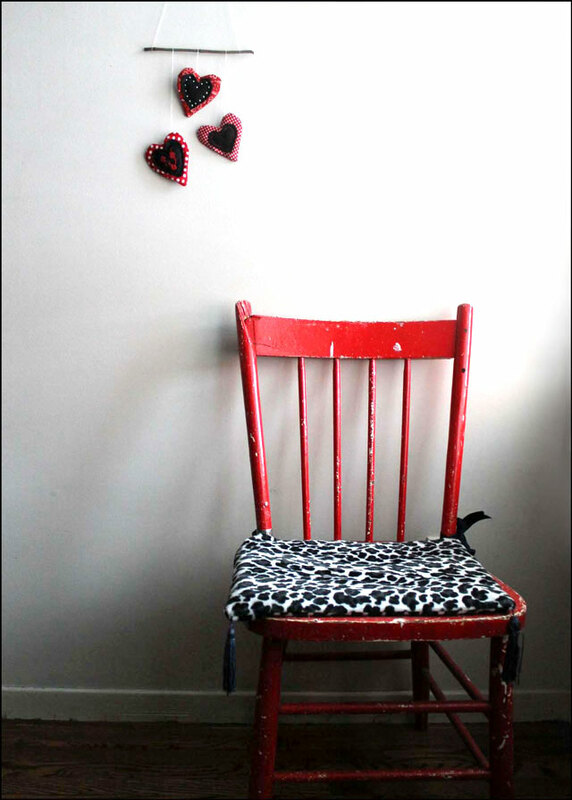 But one of the very few things he held onto was this old red chair. It was an old cast-off piece that was already chipped and twice repaired when it entered his life when he was a preteen. He tells me he was this close to leaving it behind years ago, and I am so glad that he decided to keep it. I made the animal print cushion for it when we first moved in together. I really appreciate you taking a look and wish you a great Tuesday. 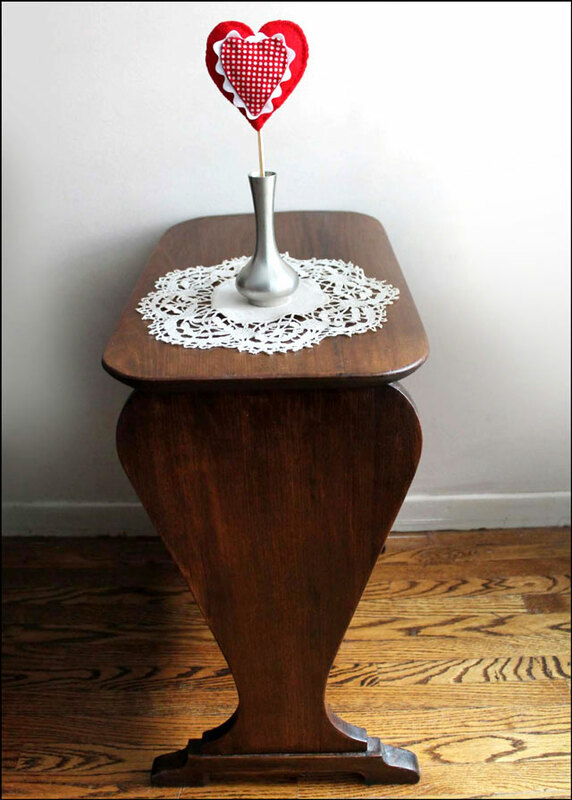 Your DIYs are always SO impressive and this one I can actually picture seeing in my house. It’s quite sophisticated. I’m going to share this! I love hearts too. I have kind of gone back and forth with them. I love them, but have always worried that they are cliche or cheesy. Recently, I decided I don’t care. 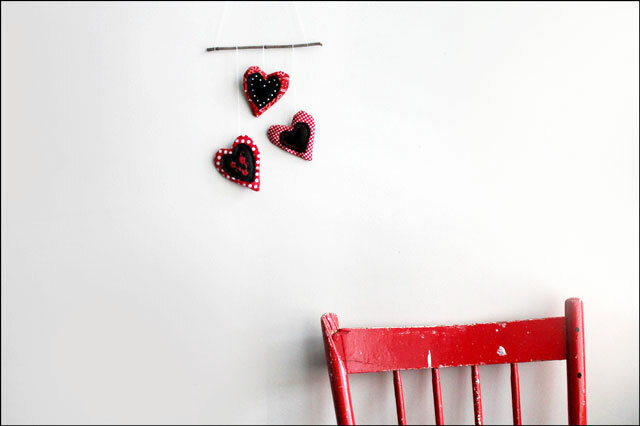 I will put hearts in my artwork. And I will not feel shame over it. Heart lovers unite! Your fabric ones are adorable and I loved hearing about the fabric store. I would love that place. I am always drawn to places like that. I sense treasure.